A great site where you can look through Sam Bentley's amazing art and books. A great person that was always there to help. A great fan books site made by the amazing Kroton_28. A small group of bookworm writers (including me!) write special books for different doctors. Some fabulous stories by some fabulous people! An amazing site that is always up to date on the latest who merchandise! You can comment on what you think about the merchandise. Also some familiar faces are on it. Definitely worth a look! A great whovian/star wars site run by a great person, Dalekwho! Look through his great stories and Reviews. If you like both Doctor who and Star wars, Star Who is the site for you! A fantastic site where the fabulous Trenzalore shows you his Art and... well stuff. A real know it all when it comes to reviewing classic episodes of Who and merchandise, also a great Graphic Artist and talented writer! Go check it out! A great site where my friend Matthew writes his doctor who spin off series: The Dr who kid! An adventure that follows ex-timelord president Tau and his companion Dan! A great place for people who like audio books, original series' and more! Also I am doing a short for December! every time I look on the internet I see great graphic artists, writers and drawers. But Kroton_28 )mentioned above) is one of the best! He does the most amazing graphic designs and if you have ever wondered where I got my awesome icon from, now you know! He works extremely hard on everything, and is the founder of the highly contagious KROTON FASHION! You MUST check it out! A great YouTube channel run by my friend Jack. He makes excellent Minecraft videos and deserves more subscribers. A great person, friend and gamer. Also, he is a real brainiac at school so he knows almost everything! 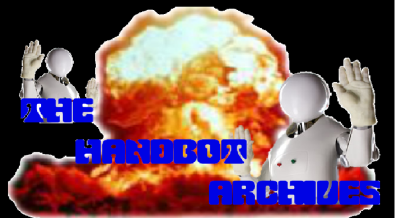 Hanbdot_Studio is the video equivalent of the Handbot Archives. Extra Content and more! If you loved this site then you better check this out!